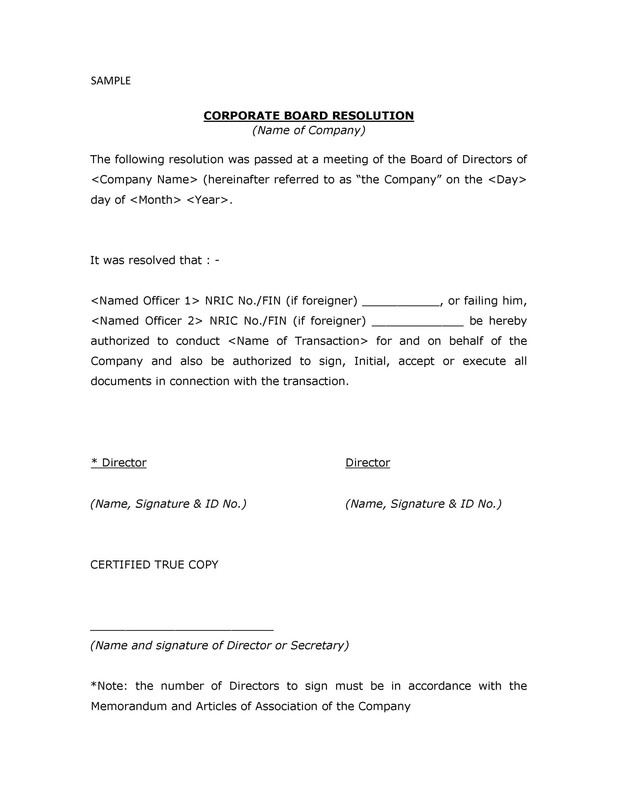 A corporate resolution is a type of corporate action. It typically comes in the form of an official document. 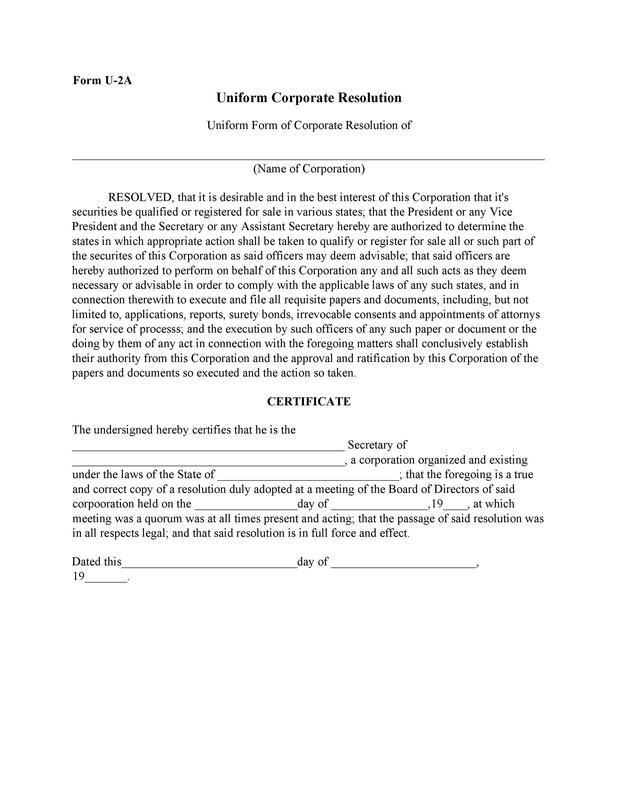 The document is a corporate resolution template. 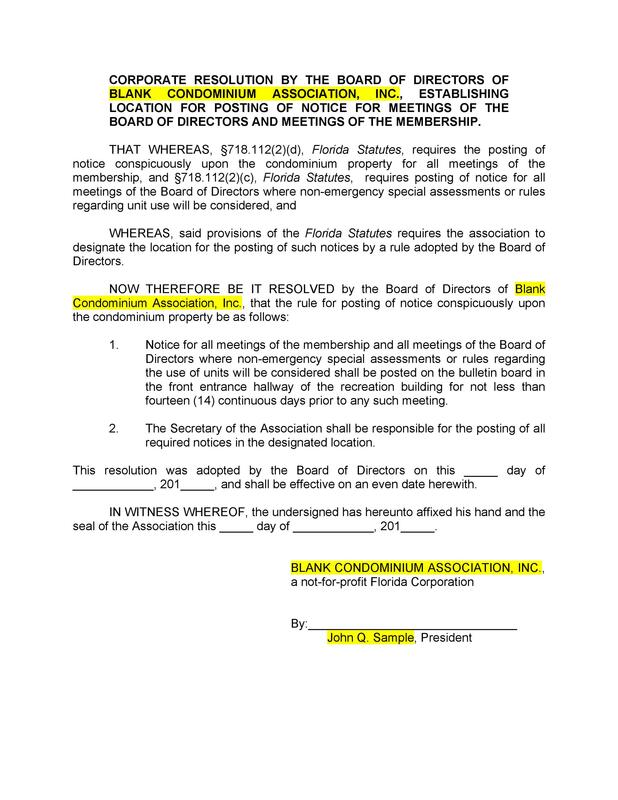 Then the board of directors of the corporation will vote on the resolution. 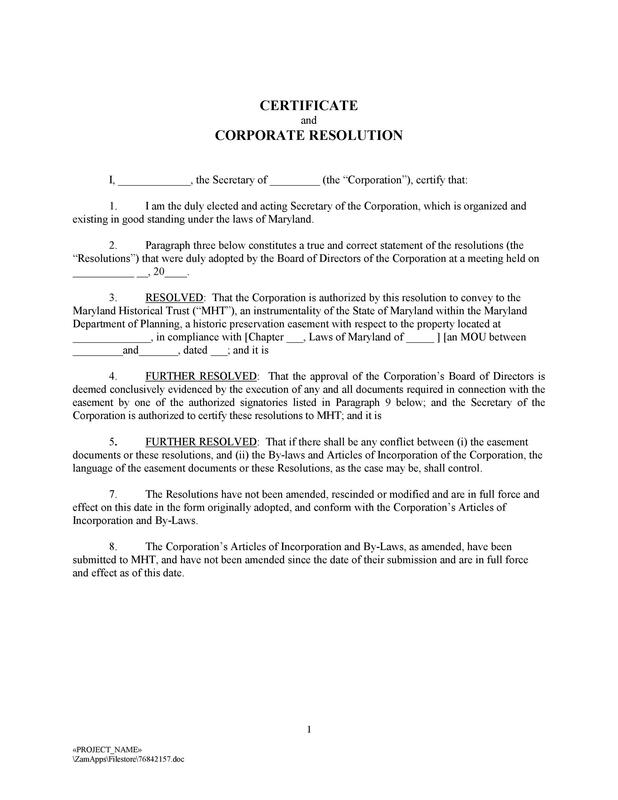 Sometimes, the resolution can also come in the form of a “corporate action.” In such action, the board of directors may also use an official document. 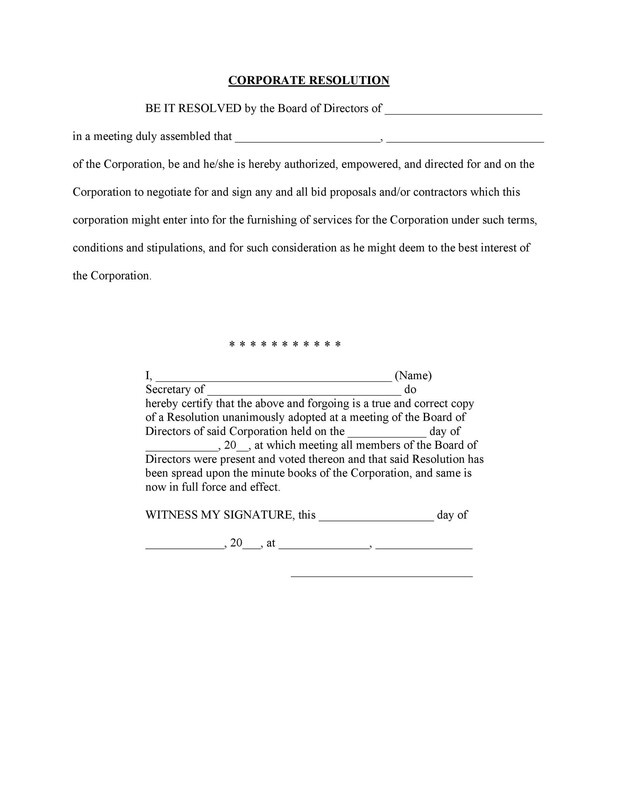 They’ll use the document to put aside the formal notice of a meeting then consent to the resolution. 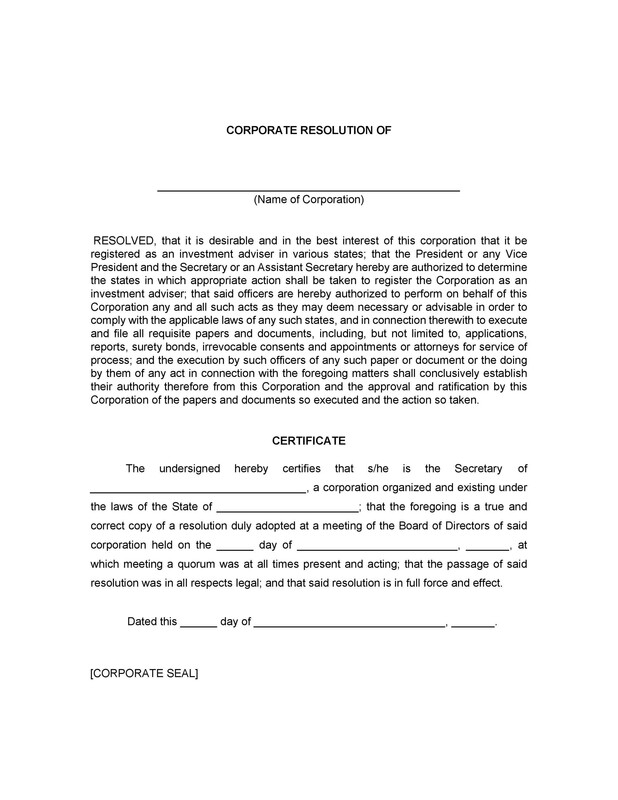 A corporate resolution sample can be about any topic or subject. 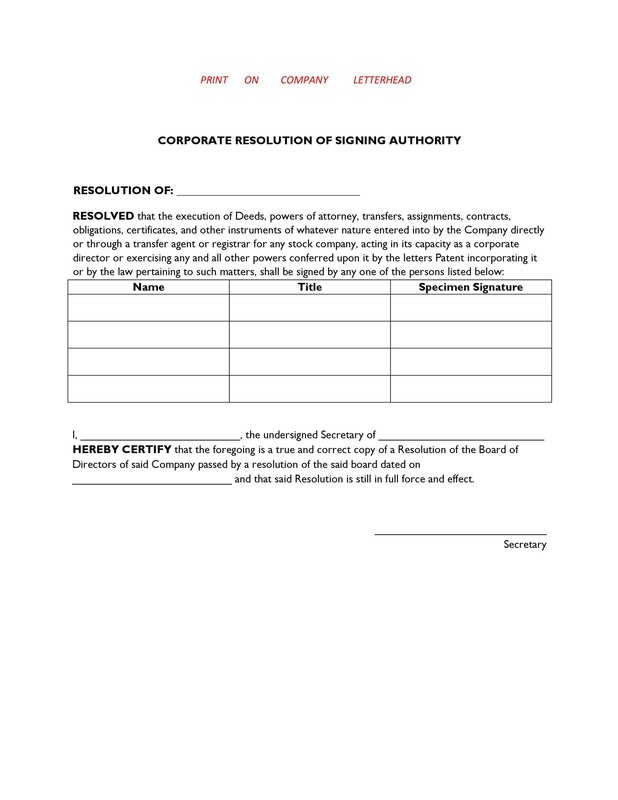 You can use it to define the people authorized to act on behalf of their corporation. This is a common subject of such document. This is because security firms and banks require it for you to open an account. 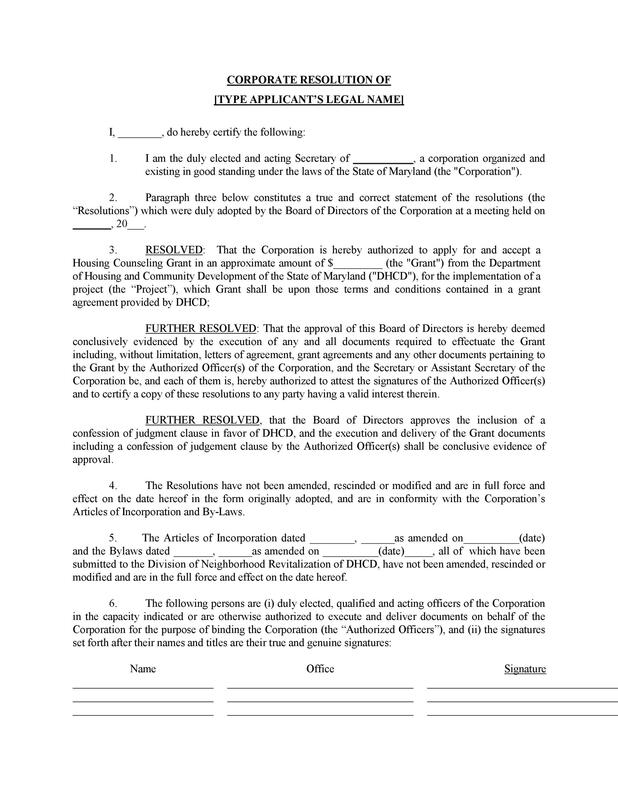 Title agencies may also require a corporate resolution form. They need it when selling real estate that’s owned by the corporation. 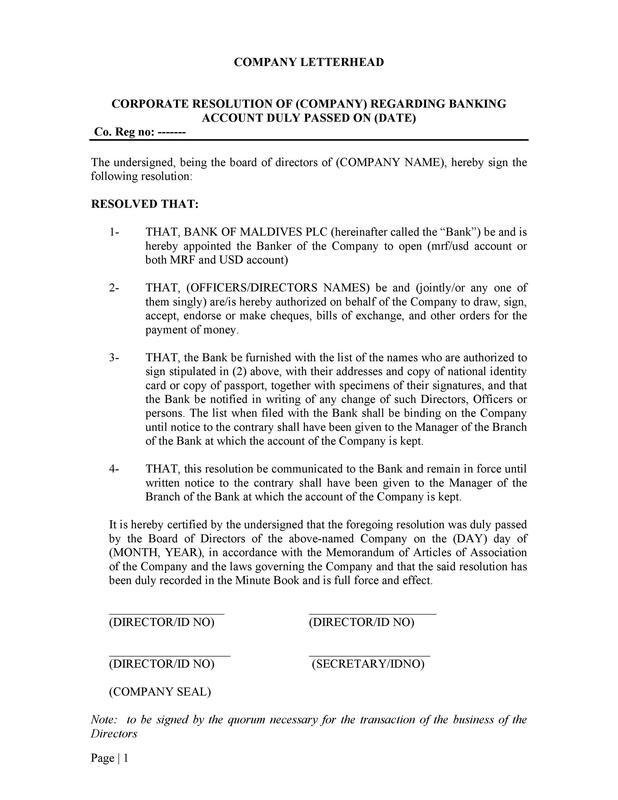 The structure and format of the document may vary. It depends on the state in which you organize your corporation. It’s important to make a corporate resolution template. You need to make it during the course of the year to help you make relevant decisions. It’s crucial to document all the decisions of the corporation. This is especially true if you have multiple directors and shareholders. Because of all the varying factors, such documents may be simple or intricate. and make other relevant decisions for the corporation. You may ask yourself, what exactly is a corporation? It’s an entity which has different levels of responsibility. It’s an entity which exists apart independently from all its shareholders. A corporation has the advantage of corporate personhood. This means that it can receive similar rights as those given to an individual. 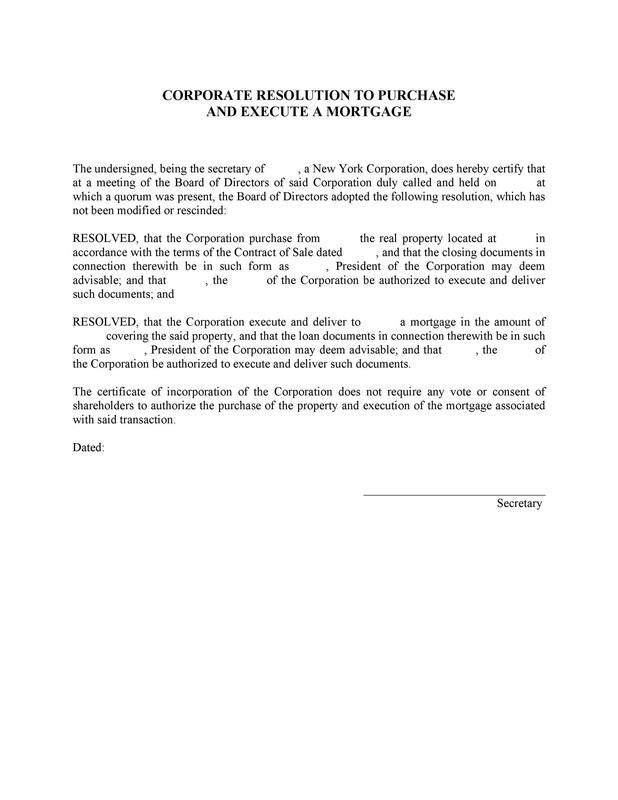 Also, a corporation has additional recordkeeping responsibilities and other formalities. 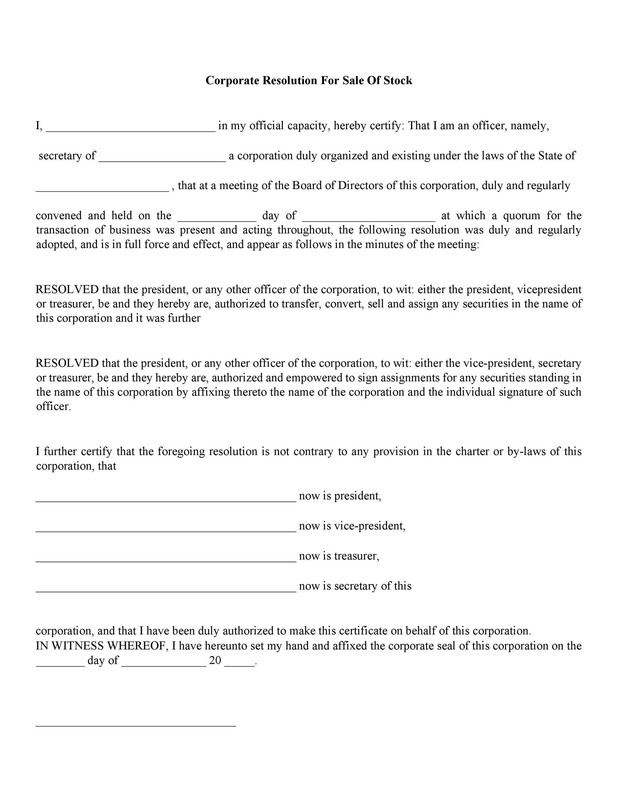 The authorized individuals within the corporation can perform legally-binding actions for the corporation. But in order to do this, they need to make a corporate resolution sample. It’s also important to follow the appropriate format approved by the state. and disagreements or issues between those who are part of the corporation. Such resolutions are usually needed for a company to perform certain actions. Some examples are for executing contracts, opening bank accounts, and many more. In these situations, the owners or directors must all agree with each other. When this happens, they’ll be able to transact business successfully. Sometimes, resolutions are also useful for solving conflicts or disagreements. For instance, the shareholders may not agree with how the corporation does business. When the corporation issues stocks to new or existing shareholders. When approving a significant lease or purchasing real estate. 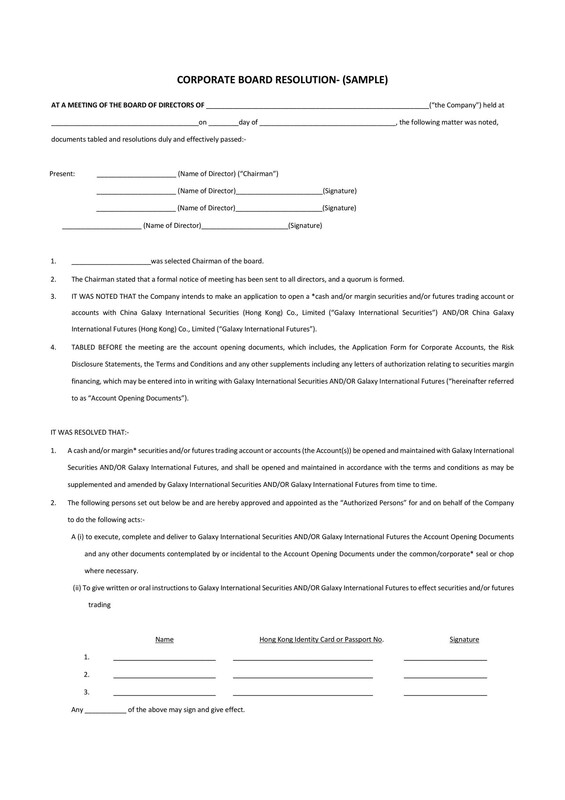 When authorizing a substantial loan or credit line. When making elections for state and federal taxes. When adopting retirement plans or stock options. When changing fringe benefit or key insurance plans. During the proceedings of director and shareholder meetings. 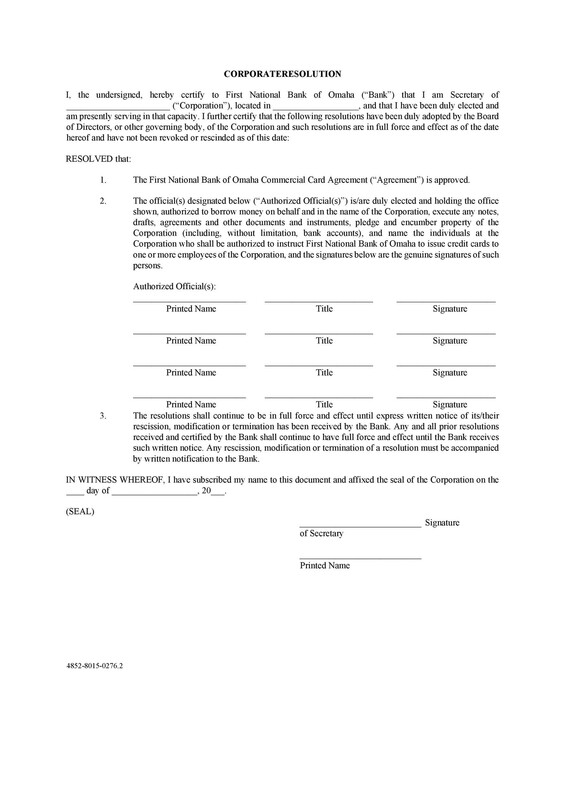 All these are situations which typically require a corporate resolution form. Having the document would create a paper trail which will be very helpful for later review. 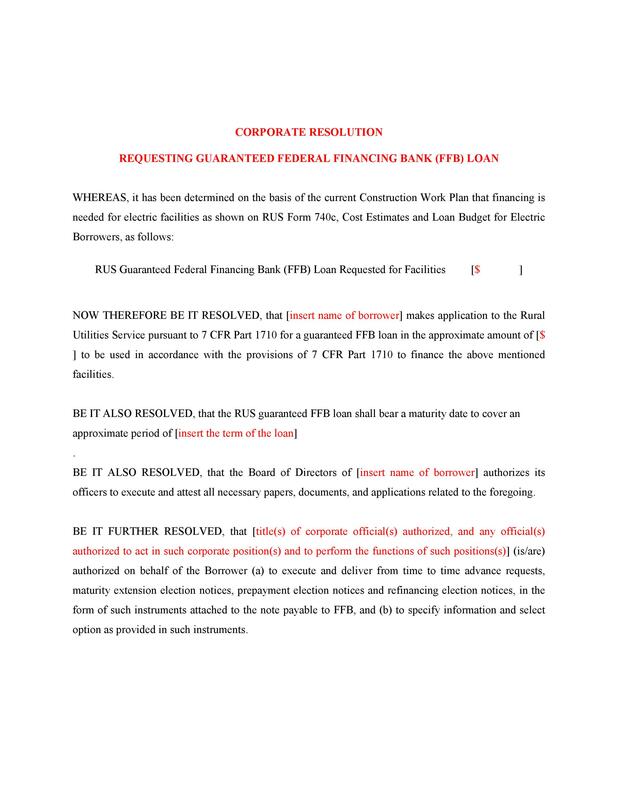 In time, the officers of the corporation, banks, and more may want to see the official documents. A lot of people choose to incorporate. One reason for this is so that they can isolate their assets and restrict personal liability. However, some corporations don’t follow the applicable incorporation laws. When this happens, the person won’t benefit from incorporating. So, the corporation should be really diligent when it comes to following rules. They should properly do recordkeeping, holding meetings of shareholders, separating finances, and more. This is another situation where corporate resolutions are necessary. With it, the corporation will be able to follow all the applicable laws. Such resolutions are part of a corporation’s guiding principles. Corporate resolutions are a means by which corporations can make major decisions. 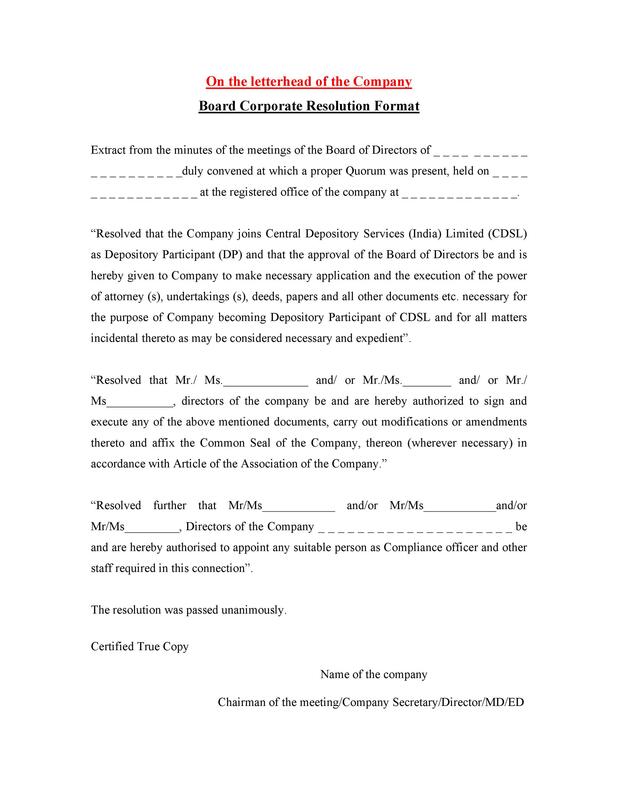 Such document would formally record all the decisions made by the corporation. Then they need to file the document with all the other official records. 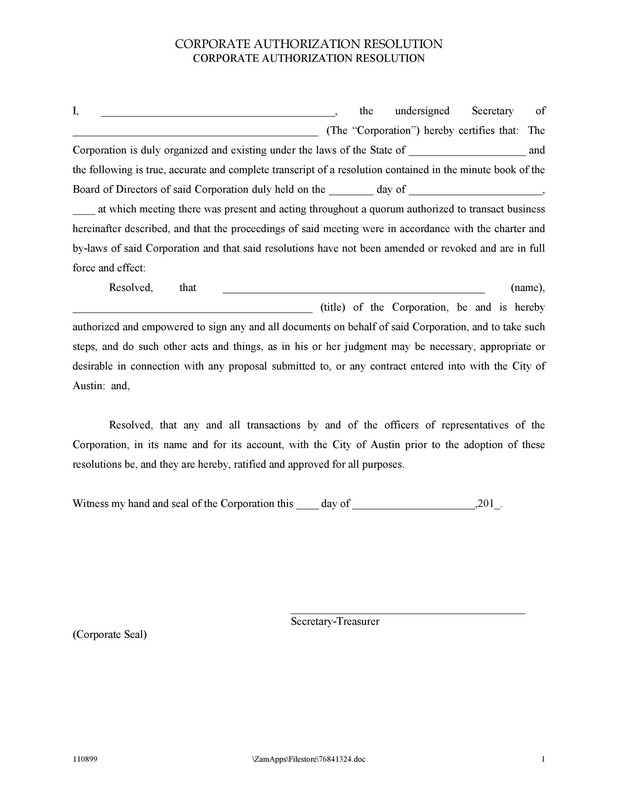 Such documents help the corporation maintain compliancy with all the required corporate formalities. 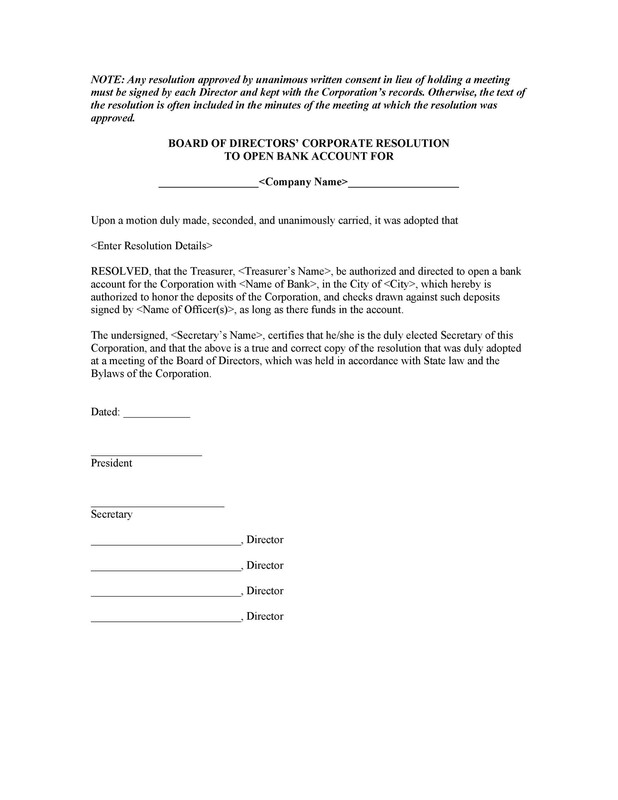 There are many types of corporate resolution templates you can make. You can create your own template or download one from here. If you choose to download a template, make sure to check the contents. There may be times when the board of directors of a corporation performs a major action or decision. 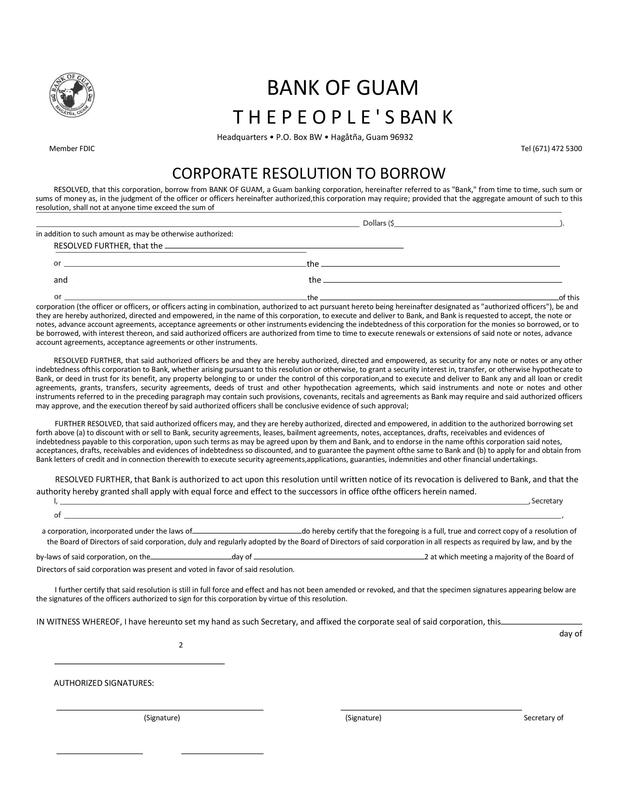 In these situations, they use a corporate resolution form. It serves as a legal documentation to record the event. 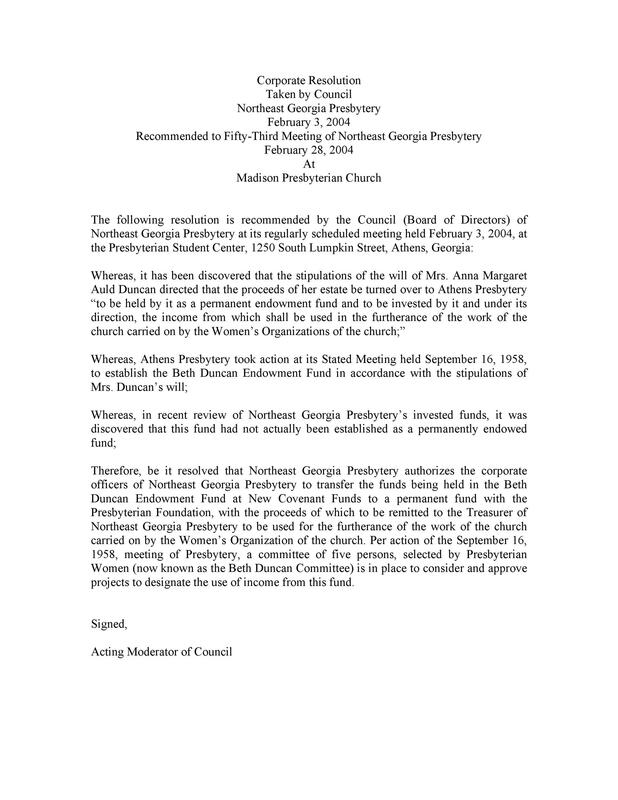 This document becomes useful when all the members of the board make a unanimous decision. They would then pass the resolution by filling up the form to abide by the law. Therefore, you need to create a well-structured template to use as needed. 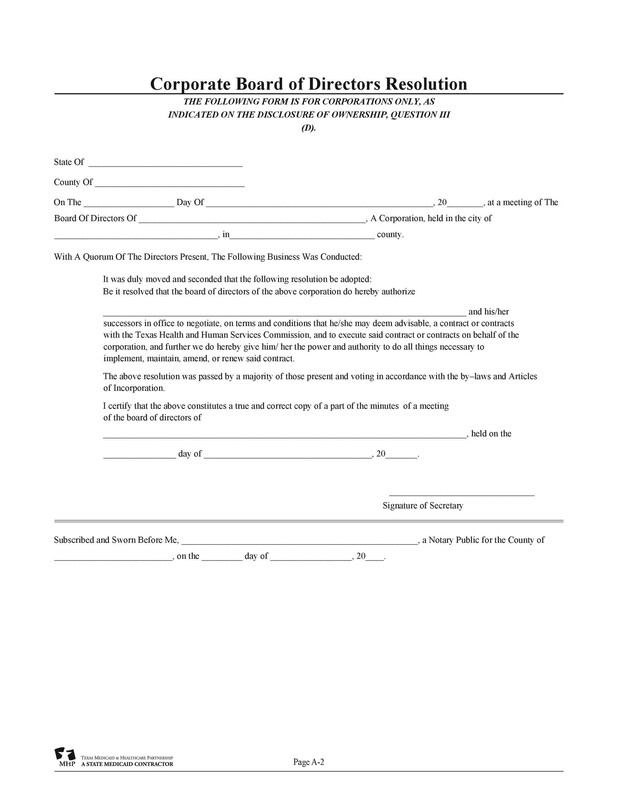 This form is very useful for corporations and companies. They can use it when they’re trying to resolve any issues or make decisions. If you plan to create the template yourself, you need to follow the right format. Also, you need to include all the relevant information in the document too. 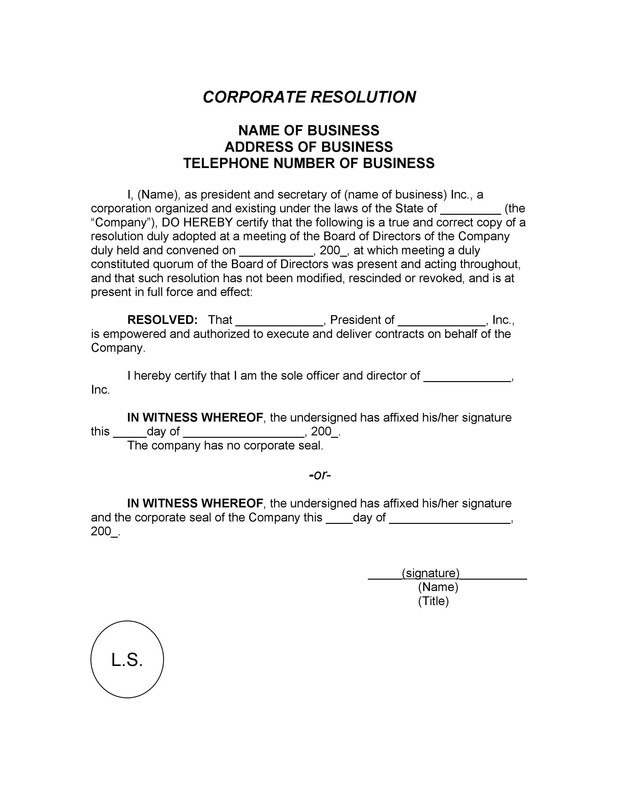 When you make a decision, document it using a corporate resolution template. The same thing goes for when you resolve an issue or conflict in the corporation. After filling up the template, the board of directors needs to sign it to make it official. 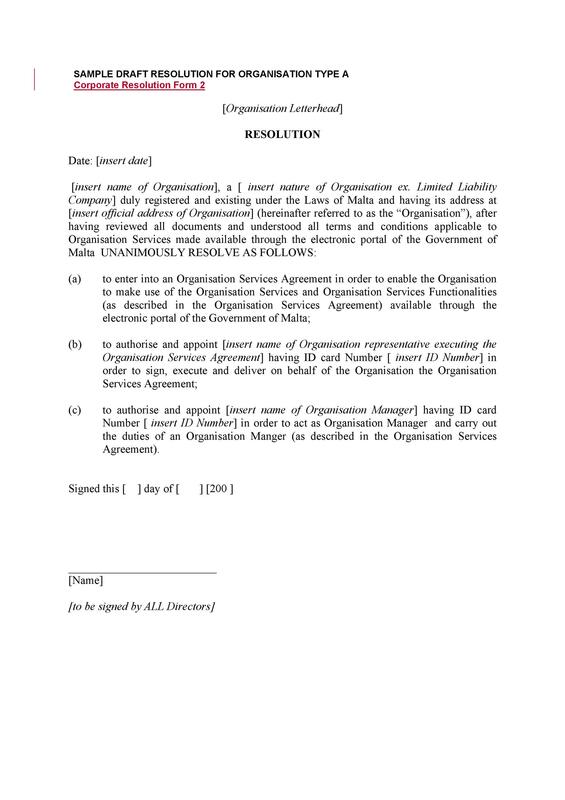 A well-made document effectively presents the subject of the resolution. It will also include the details of the final decision and the signatures of those involved. Whenever you make a major decision or resolve a conflict, you need to document it. This will create an official record of what transpired in the corporation. Such records can come in handy if there are any questions raised about the issue. They can also be very useful in case you’re faced with any lawsuits. 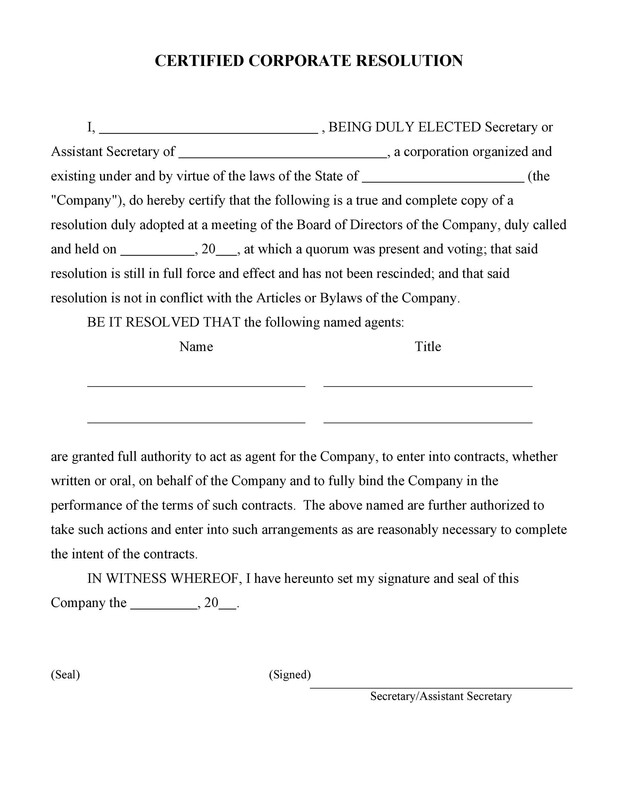 At the very top of your page, state the legal name of your organization. 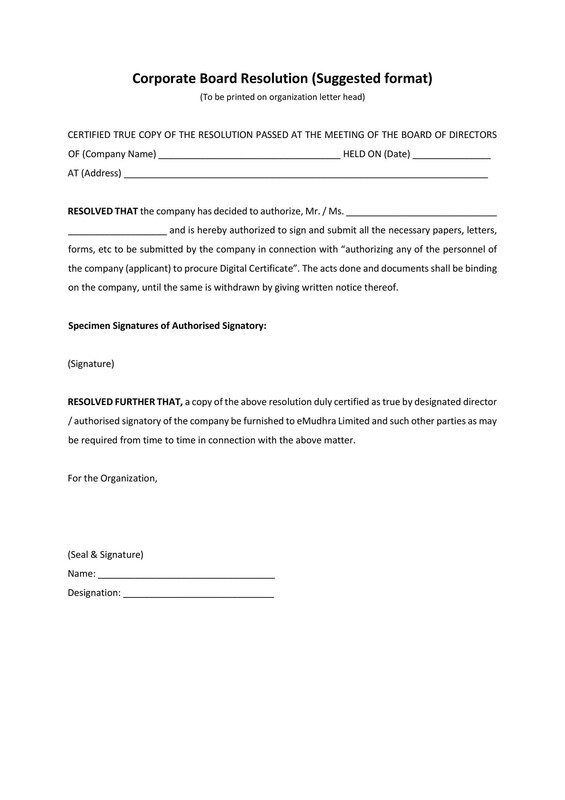 Doing this will show that your document is official. Continue by adding more legal identification. You can include the state you’re in and the incorporation date. Add the venue of your meeting. Also, add the time, date, and the attendance of a voting quorum. There’s also the option to include the names of all the board members. It included even all the individuals who attended the meeting. Include all the resolutions involved in the meeting. Then, describe in detail the decisions made. Represent each decision separately. You have the option to include the details of any discussion done about the matter at hand. You also have the option to add the results of the vote. Finish your document with a legal testimony of truth. The document should attest that all the information you presented in it is true. 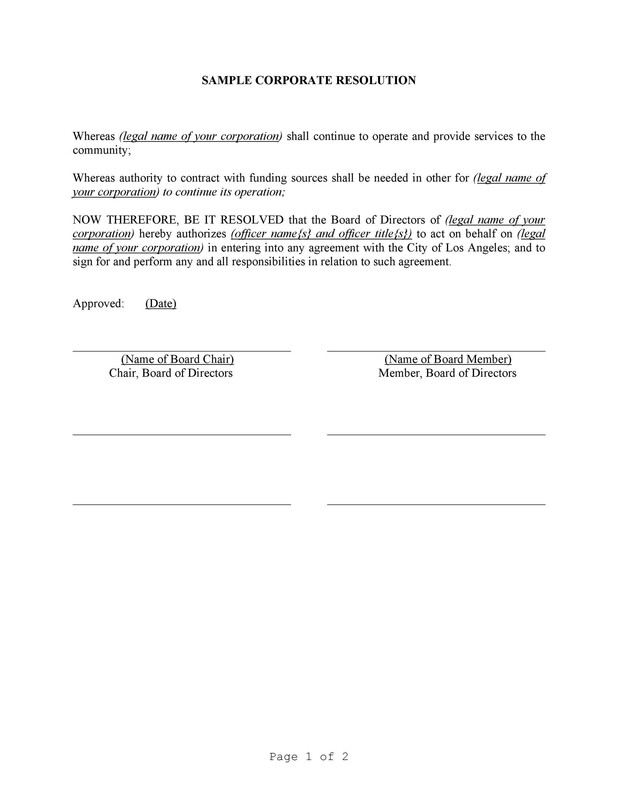 Also, include the dated signatures of all the people present during the meeting. 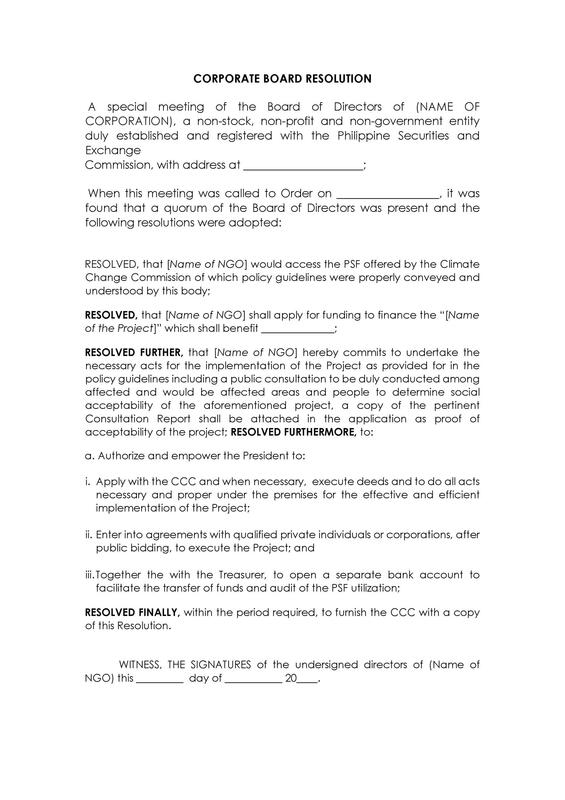 These include the chairman, vice chairman, corporate treasurer, and corporate secretary. You can make different kinds of corporate resolutions. Make one to document internal records along with the details of all the decisions the board made. 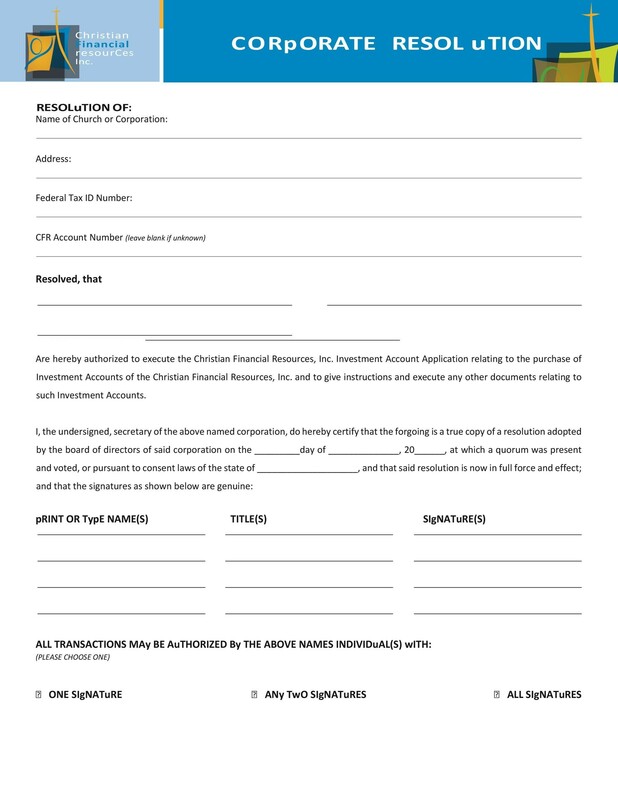 You can also make one to give to outside entities such as banks. These are usually required for distinct business transactions. Include all the details in your resolutions meant for internal documentation. When making a document for external purposes, simplify it. 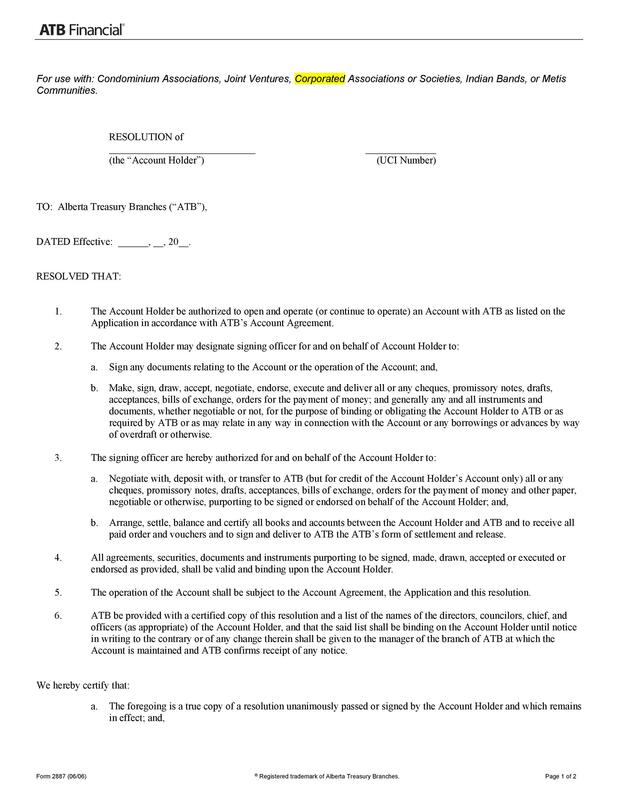 You only need to record that the board agrees to transact with the business in question. The legal requirements for such documents are fairly straightforward. Also, they don’t vary as much from one state to another. If you want to be sure of the template you’ve made, have an attorney review it first. Do these before you adopt any relevant resolutions into your company’s official records. There are many corporate resolution samples available out there. It’s typically used in companies and corporations. 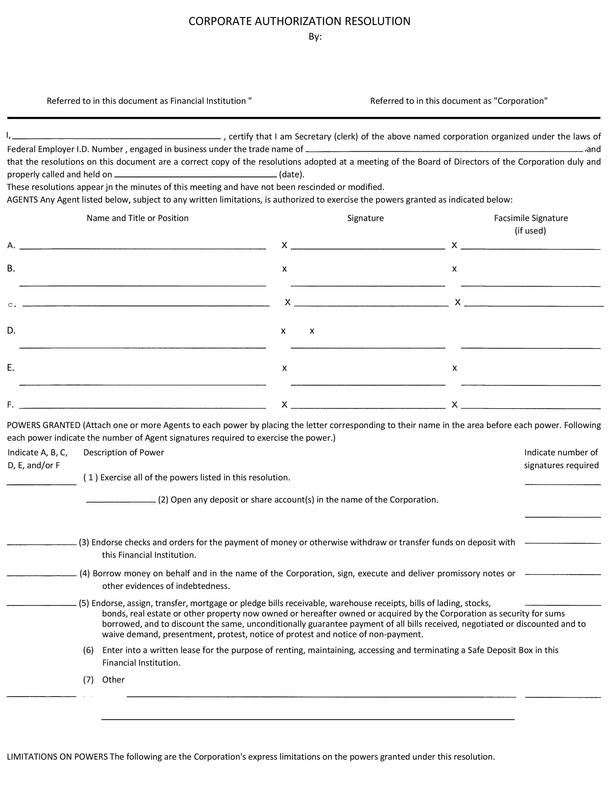 You use this document when you perform an important corporate action. The company’s board of directors either voted on or will vote on the actions written in the template. They’ll do this in a specific meeting meant for the corporate resolution. 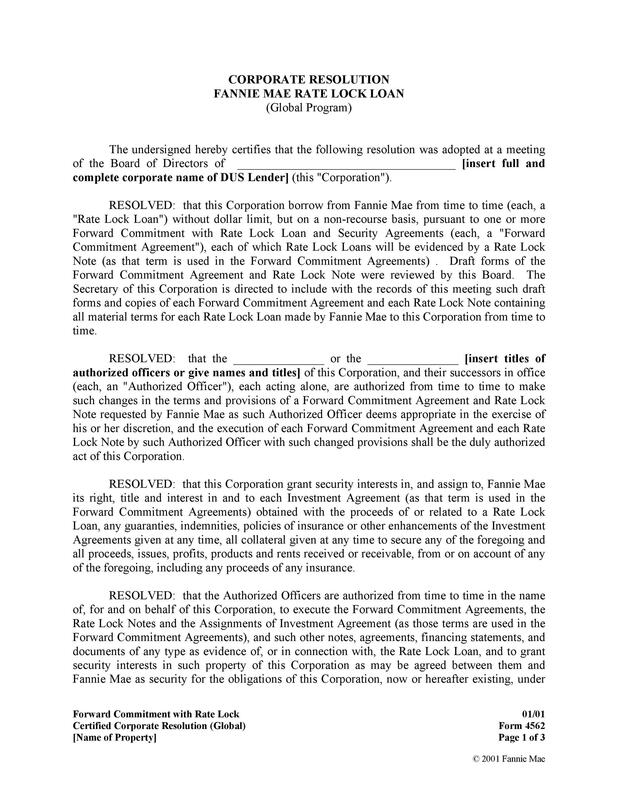 You can use the document to present any decision or issue made by the corporation. It’s typically used in these situations. Use it to represent the people allowed to act on the behalf of the corporation. 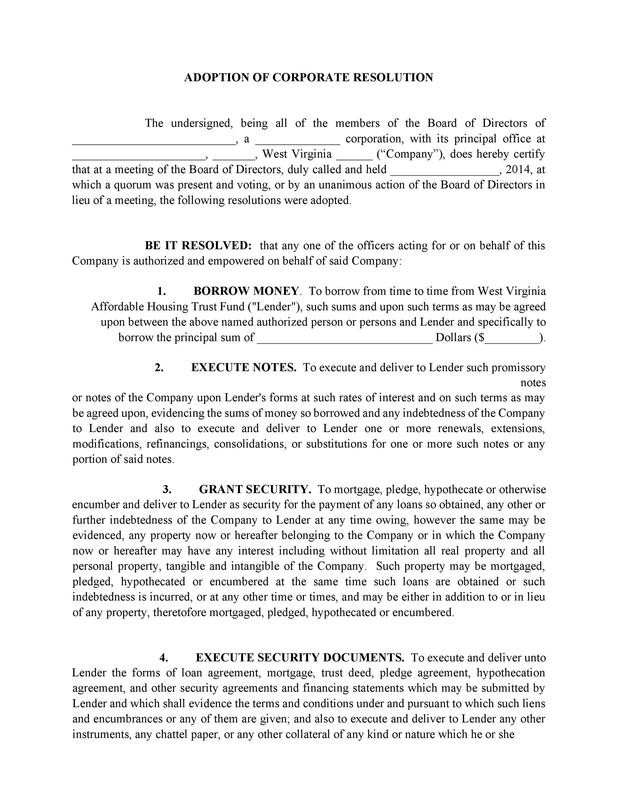 You can also use the document to make decisions about property purchases and such. The document isn’t required for all types of situation. But it’s always better to have the document for the protection of the corporation. 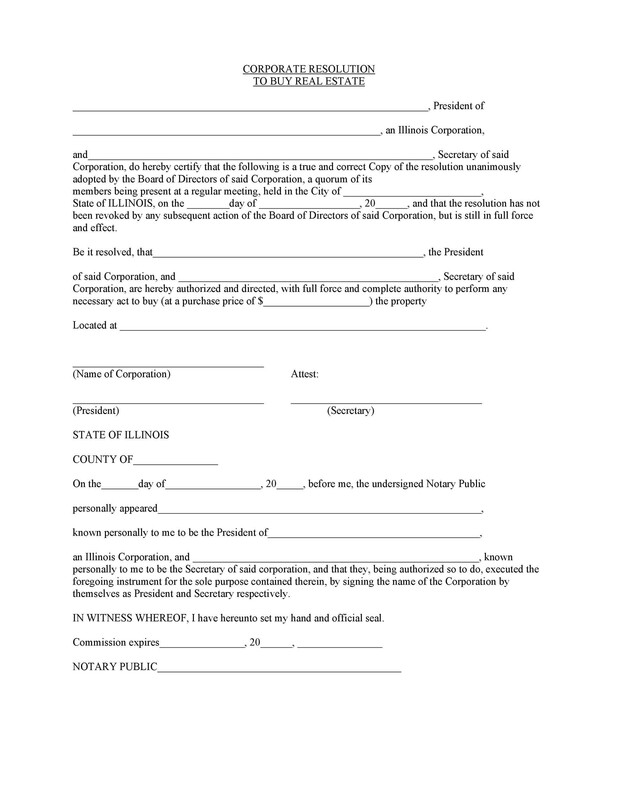 You may need the document in case of any discrepancies, disputes or legal issues. 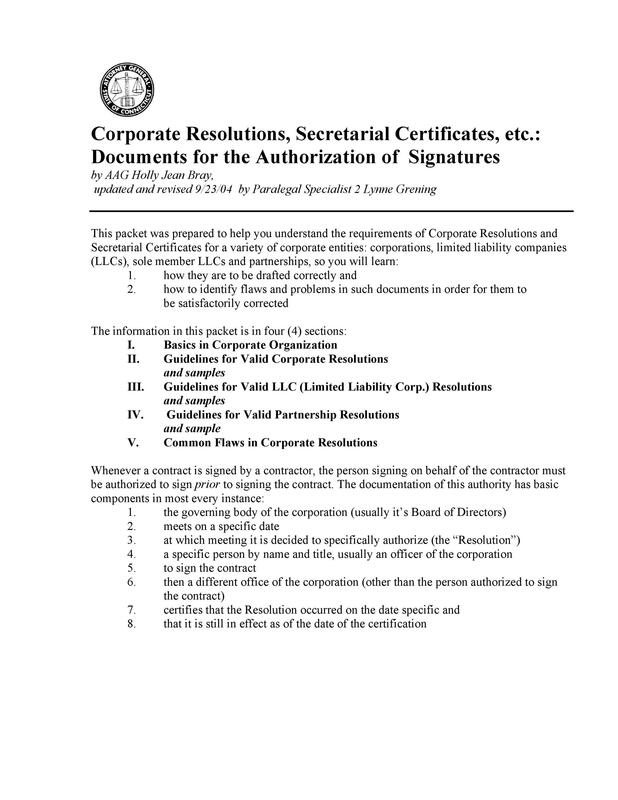 The corporate resolution template is a legal document. When it comes to such documents, stakes are very high. This means that you can’t create a document that’s unclear or hard to understand. Create a document that’s succinct and clear as possible. When it comes to legal writing, less is definitely more. Generally, it’s better to use the active voice instead of the passive voice. Using the passive voice may cause misunderstandings and confusion. It’s better to have the subject do the action. This makes the sentences clearer. Ambiguous pronouns are those which refer to more than one antecedent. Using such pronouns might leave your readers uncertain as to what you mean. So be very careful when using them. When you’re writing your document, you don’t have to make it too long. It’s better to create a short document which is easy to understand. In order to convey your message, go straight to the point. Adding too many words may cause a lot of confusion. Legal jargon is very useful when writing legal documents. However, over-using such terminology can, again, make your document confusing. 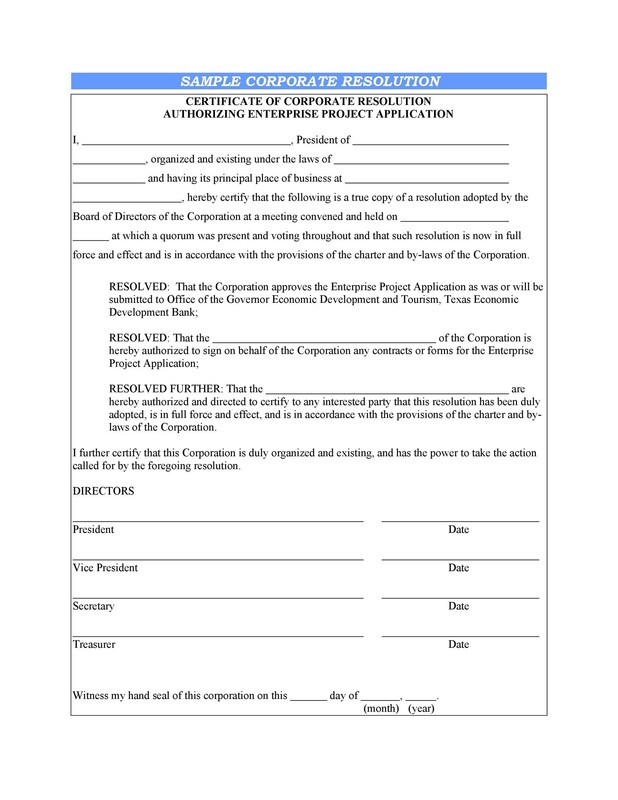 If you use succinct language, your corporate resolution form will be more effective. Proofreading is one of the most important parts of making legal documents. No matter what kind of template you make, don’t forget to proofread it. Check for any spelling or grammatical errors. This will ensure that your document is accurate and professional. You can also ask other people to proofread your document. They may see mistakes which you’ve missed when you checked the template.